A commonly asked question by companies considering taking the plunge from Microsoft Access to Quickbase is why do so in the first place? We list the top five reasons to switch from Microsoft Access to QuickBase. The modern business has changed dramatically over the past five years, cloud based services such as Google Drive and DropBox have become a common tool within an organisation. Switching from onsite installed Microsoft Access, to a cloud based system such as QuickBase is the necessary next step. The outcome of this is all of the benefits of cloud computing become available and that the development of a database can be done from any location, without the need of a network connection to the business itself. Switching to QuickBase means the headaches of upgrades, maintenance, bug fixes and database corruption are no longer a concern of the administrator. Whilst the end users have access to the most up to date and current information, from anywhere in the world, from any operating system such as Microsoft, Apple or Android, this includes smart phones and tablets. Anyone with internet access and a web browser is able to access a QuickBase database, as long as permission has been granted by the administrator. Microsoft Access has come a long way since its initial introduction in the early nineties and continues to be a fantastic product for data management. However, as the number of users continue to increase within an Access Database, the harder it becomes to manage the security. In fact, even some of the most experienced developers of Access have been caught banging their heads over security setting. QuickBase user security is simple yet very effective. It allows the developer to lock down what users can see, add, edit or delete very simply. Adding more incentive, developers also have the ability to see how security will work for end users, by testing the Roles they have created. QuickBase is easy and simple to use. Within hours of being first introduced to QuickBase, a new developer can find themselves completing simple and effective databases ready for release to their end users, usually with little understanding of how QuickBase works. The free online training provided by Intuit, allows new developers to attend classes live, or watch previously recorded sessions to get up to speed with all that is QuickBase. To simplify things further, third party developers have created integration tools which will import an entire Access database into QuickBase, leaving the developer to only update the forms and reports they need. Intuit is a well-known, trusted and respected company. 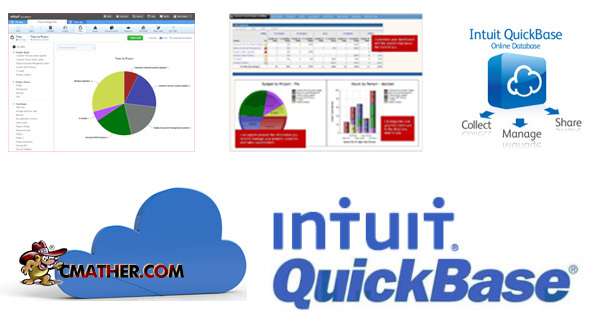 Every business knows of, or uses their accounting package QuickBooks/Quicken. Established over twenty years ago, it continues to be the market leader in accountancy packages and cloud based services such as QuickBase. Why Switch From Microsoft Access to QuickBase? Summarising, with cloud based systems becoming the norm in business, the question “Why switch to QuickBase” is quickly becoming “Why Not?”. Being able to take a current working model such as Microsoft Access, and turn it into a more powerful, secure, user friendly and trusted product has to be a positive step for any business wanting to improve its data management. Kate Pentreath provides support to clients in Quickbase, assisting them to develop their own unique QuickBase Apps, customising user interfaces, API calls and other functionality within the cloud based service, which also includes the project management of these functions. Over the past 10 years Kate has developed applications for Bendigo Health, Latrobe University (Bendigo) and several General Practice Training Organisations.